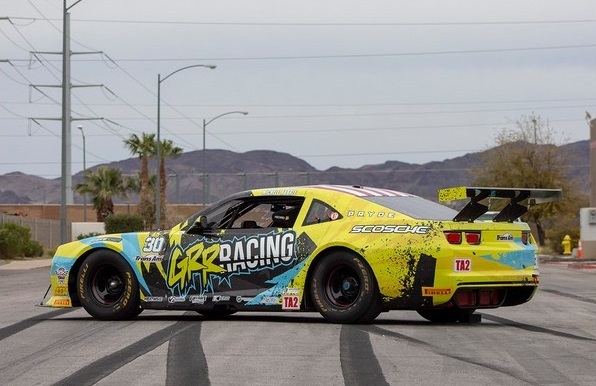 Las Vegas based racing team, Grr Racing, has officially announced their 2019 season plans with a new car, new livery, and new series premiere. Team owner and 3 time SCCA Road Racing Championship driver, Michele Abbate, will be making her debut in the professional Trans Am Road Racing series in her Grr Racing TA2 Chevy Camaro. Last October, Abbate made her debut in the SCCA National Runoffs at Sonoma and earned herself a podium finish in the GT-1 class. "I am beyond thrilled to announce our Trans Am effort. This has been a dream of mine for several years and it has taken an incredible amount of hard work, dedication, and perseverance to get here. I'm pumped to be racing in the competitive TA2 class and I know our team will bring a fresh new image to the Trans Am series. I am thankful for the partnerships that I have and I would not be here without each and every one of them," Michele shares. Crew Chief and husband, Anthony Philleo, has been by her side since they met in high school. If you haven't heard of Abbate, you might want to do your research. This year Michele joined the ranks of global icons Ken Block and Vaughn Gittin Jr. with the world-release of her SCCA championship winning Scion FRS scale replica HPI Racing RC car. As a former factory driver for Scion Racing she earned the manufacturer two road-racing championships, in two different chassis, as well as became the first female to be awarded "Driver of the Year" in the 66 years of Cal Club's [SCCA Region] existence. Together their team is Grr Racing and they have accomplished an impressive amount of achievements, exposure, and championships. In addition to her US racing experience, Abbate has also raced internationally in Australia at the infamous Mount Panorama for the Bathurst 6 hour.